← Did the Common Core eliminate handwriting as a skill kids need to learn? I can’t believe it! Do you read stories to your children at bedtime? If you do, you are one of a small group of parents. An online survey of more than 1000 US parents shows that one-third of parents read to their young children every night. Half the parents said that their children prefer watching video games or watching TV to reading. Another survey of 2000 mothers in Britain showed that about 2/3 of mothers read to their children, but only 13% read to their children every night. Parents say stress at the end of the day and lack of time are reasons that they don’t read to their kids. But TV, video games and other distractions also are factors. Yet reading to children at bedtime can offer so many advantages. Establishing a bedtime ritual—a bath, brushing teeth, kissing family members good-night, a prayer, and a snuggle with Mom or Dad while they read—is a time-honored way to settle children down and prepare them for sleep. Children learn fluency by hearing an adult read. They learn to slow down for commas and periods. They learn to change their tone for direct quotes. They learn that certain parts should be read faster or slower, louder or softer, or in a high squeaky voice or a low threatening voice. In the privacy of the bedroom, parents might feel more inclined to “act” out the words of the book—to be silly or gruff, whiny or sugary. 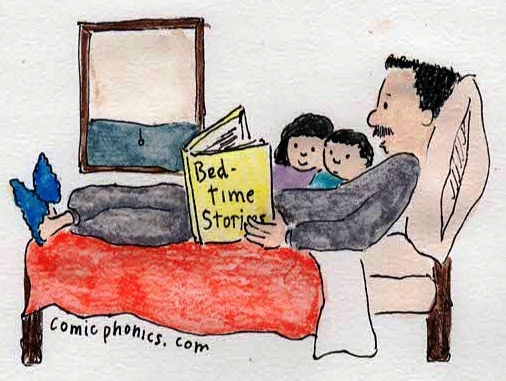 Children sometimes see a different side of their parents during bedtime reading. This can be a great ice breaker between a child and a usually distant parent. Children learn vocabulary. They can ask, “What does that mean?” and get an immediate answer. Children learn about setting, plot, character, tension and happy endings. They learn about culture. Especially as children get older, parents can read books to a child which the child isn’t ready to read yet but which the child is quite able to understand. Children often reveal what they are thinking and feeling during a nighttime read. Snuggled safely with Mom or Dad’s arm around her, a child might open up about her hopes and fears. This is a time for the child to feel protected. In our next blog we’ll talk about how you can establish bedtime reading if you don’t already do it, or how to improve the experience for you and your child. This entry was posted in fluency, how to make learning fun, methods of teaching reading and tagged build vocabulary to improve reading, how to encourage more reading, reluctant reader. Bookmark the permalink.